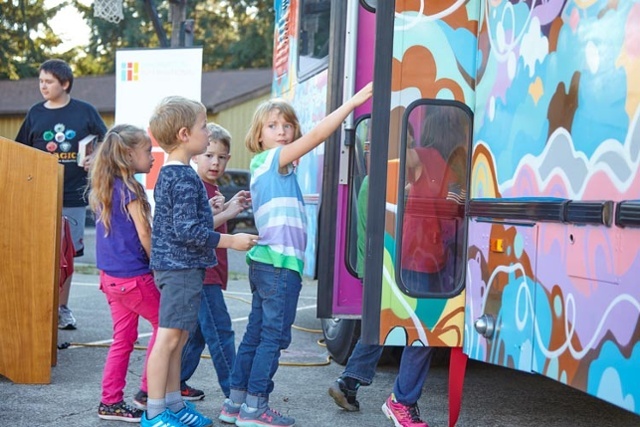 On October 15, 2015, an exciting ribbon cutting ceremony happened for the River Road Park Imagination Bus. The day marked the birth of a roaming classroom on wheels known as "Artie". This initiative continues to deliver arts education to Lane County kids and schools in need. Representatives from Imagination International, Inc. (iii), the River Road Park District, and Lane Transit District, along with local elementary school students gathered at Emerald Park in Eugene for the official dedication ceremony for the River Road Park Imagination Bus, or "Artie" as it has been affectionately dubbed. 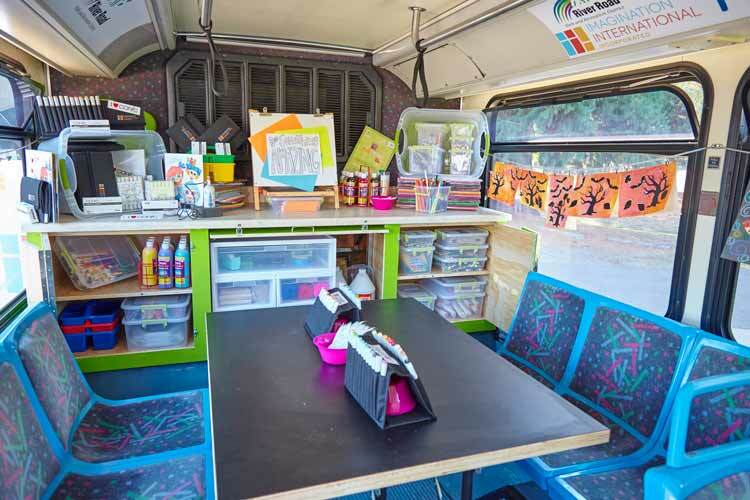 Artie is a 22 seat mobile classroom that will travel around Lane county and beyond bringing art education to kids in the community. If you want to get involved with the program, we encourage you to contact River Road Park through their website. River Road Park Recreation Superintendent, Dale Weigandt. 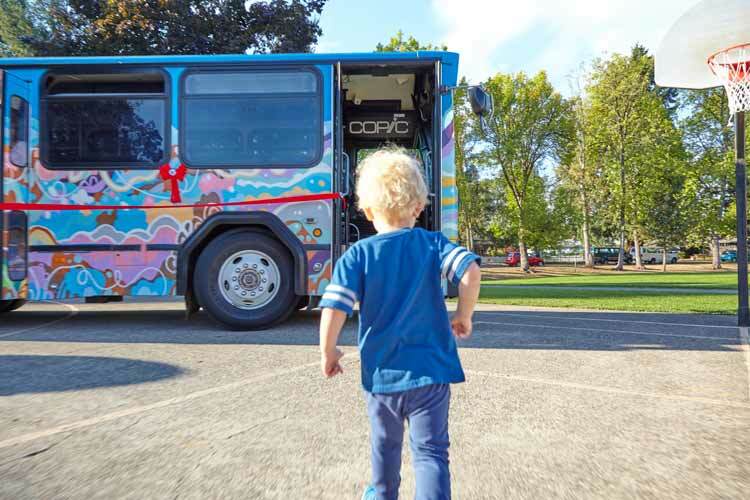 This day was a long time in the making, explained River Road Park Recreation Director, Cathy Casalegno,"The Imagination Bus was a vision of Dale’s for over 30 years" she said, referring to Park Superintendent, Dale Weigandt. Dale Weigandt explained how the project came into being: "I always thought the bookmobile was such a cool idea; my daughter used to love going to that bus and picking out books, but art has been such a big part of the River Road Park District, and art is so important for all kids, we really wanted to see art done outside of our park district - we want to see it done in the community.” said Weigandt. "This summer I met Hillary (Darland) and I told her about the Art Bus idea and she loved it. LTD donated a bus and the rest is history. Imagination International has been so generous in making this thing what it is”. Imagination International, Inc. Director of Philanthropy, Hillary Darland. "We just really appreciate creative people that have a vision for spreading joy and reaching kids... we are so happy to be able to collaborate with River Road Park and all the artists and organizations who gave to make this all happen” iii Director of Philanthropy, Hillary Darland said in her address to the crowd. 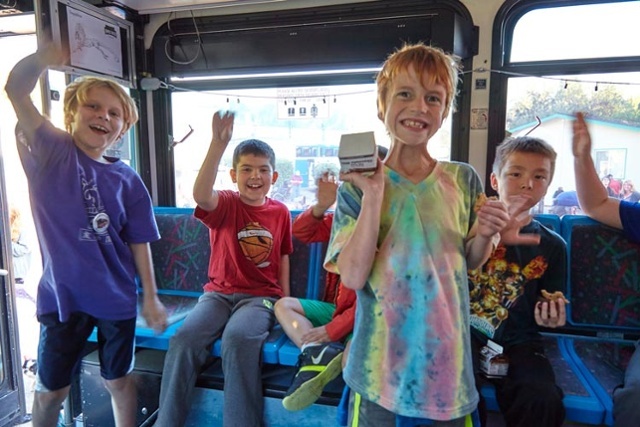 Of course, this day wasn't about giving speeches or congratulating each other, it was about the kids; the smiles on their faces when they set foot on the bus were all the thanks anyone needed!